The sun provides ten times all our energy needs everyday. Technology now gives us the tools to use solar energy as a world community. Subsidizing nuclear power guarantees war. The rest of the world no longer needs to subsidize bomb production. Everyone can use simple, clean sunshine for energy needs. By its very nature sunlight is evenly distributed. By its very structure sunlight is decentralized. The sun meets all our needs with no pollution to our atmosphere. The sun requires no maintenance work. first grid-intertie PV system for rural electric coop utility – KEC. Small solar electric system equals conservation for any utility. Because it is decentralized sunlight can best be collected and easily used at its end point – both passively and actively – with minimal transmission losses. Where there is direct solar only part of the year, mother earth gave us abundant indirect solar energy including but not limited to wood, water and wind. Now there is cogeneration, thank God. The dams of our magnificent northwest rainforest equal storage costs which are half the cost of renewables power production. 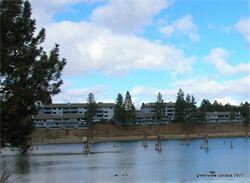 Because of this simple fact, in 1977 my husband and I moved to Spokane. I was asked to design the opera house complex but turned it down when asked to also design prisons. 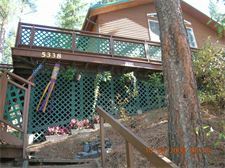 Instead we moved to CDA and I worked with Architects West and did some fine projects. Thanks to Ron Tan and Bill Dahlberg I remain in the area. 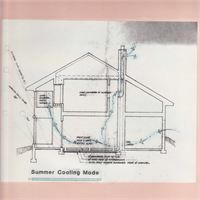 passive solar system – direct gain 9 times thermal mass to window area ratio using sensible heat storage with water. 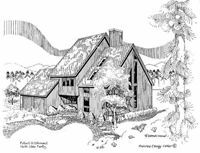 design parameters – concert hall, classroom, art studio & greenhouse exterior – steel siding & liver rock quarried by Myrtle and son Bob. new owners require privacy. They are modifiying the house to meet their particular needs. It will be even more beautiful. 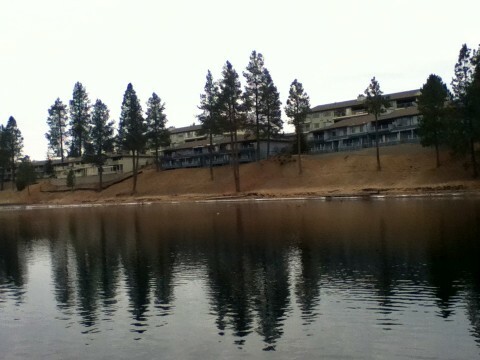 Site originally was a sawmill. Myrtle taught science at Shaw JHS, Spokane. She designed and built the first house. Fire destroyed. God wanted her to have a solar house. 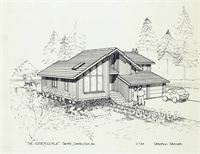 Schematic Design done with Bob Rickerts, business partner, who also designed and built the earth-sheltered house at Hwy. 95 and Dalton – using pre-stressed concrete panels for the roof. Designed and built for North Idaho College Headstart – demonstrating solar works to children. 3 basic passive solar systems = Direct Gain, Trombe Wall, & Greenhouse. Designed to be portable, they were built with donated materials, wonderful volunteers and $400 grant from Curt Nelson, Engineering Dept. Purpose: demonstrate solar works and monitor solar performance. Plans are available upon request. doors and slider windows for controlled ventilation. 1981-1982 WWP – SOLAR DOMESTIC WATER HEATING DEMONSTRATION PROGRAM – as per IPUC order, how much energy can be saved using solar energy to heat water in May and June? Results: 61% – 80% Reports available upon request. 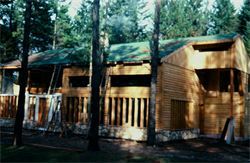 Combination of active and passive solar features. viz., attached central sunspace + direct gain + concrete thermal mass floor and wall. 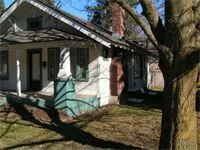 Attached garage with connecting breezeway. 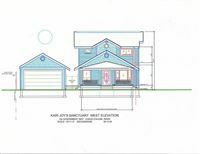 Flexible 2-3 bedroom floor plan allows site access from north or south side of dwelling. Direct Gain + attached central sunspace. For external cooling mode – temperature-activated fan at top of sunspace and/or easy-to-open upper window in sunspace. Cooling breeze created through dwelling from northside windows through doors and slider and out through sunspace. Doors and windows = dampers. Additional concrete thermal mass in floors and chimney keep temperatures cool. For internal cooling mode turn on fan only and circulate house air through concrete floor tubes. Solar Heating Mode: fan turns on when temperature reaches 85 at top of sunspace and slowly circulates warm air through insulated duct(s) and concrete chimney and floor tubes. 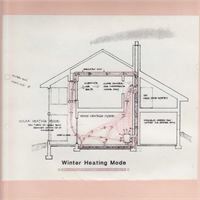 Wood heating mode – internal loop through concrete chimney and concrete floor tubes. See diagram. 1981-1982 Solar education classes at North Idaho College. Touring educational classes with Bob Rickerts for the Idaho Energy Office. Cassettes available of Rickerts talks. 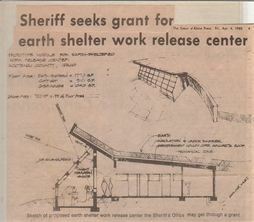 1983 Taylor Solar House located at Hackney Airfield near Athol in north Idaho. 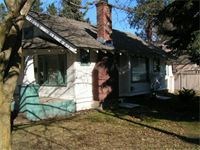 Photo shows dwelling as seen today – Dunhams are now present owners. Original structure was an airplane hanger. 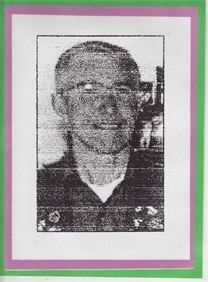 In the 1970’s Art Fall helped start the North Idaho Building Contractors Association. 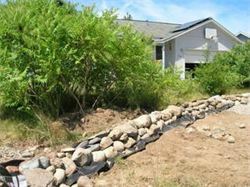 He developed the waste-heat from septic tank system. Report available upon request. 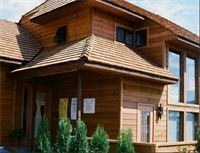 Art designed and built various experimental solar and energy-saving houses in our area and in Moscow at the University of Idaho. Before his transition in 1989, Art Fall transferred the title of “energy nut” or “e-nut” to me – thank you, Art. Future section at my website will present and share some of Art’s projects, thanks to his wonderful wife, Sue Fall. 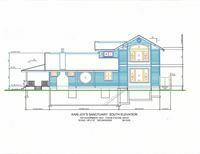 For each homeshow participant I provided a perspective rendering and floor plan for advertising purposes. Stay tuned for more Homeshow renderings. 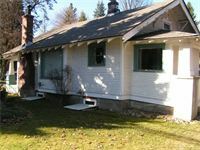 From 1984 to 1995 I designed a variety of projects including sanctuaries and dwellings for various clients – building designers, architects, realtors, builders and assessors – including Dave Salois, Gordon Longwell, Bill Dahlberg, Roxanne Gunther, Paul Heutter, Scott Weston, and Jim Miles. de la Salle was a Catholic priest who educated the Indians. The 9-foot tall kneeling bronze statue is the campus focal point and from the entry looks like a perched eagle. Deborah helped artist Bruce Wolfe design and get manufactured the white terra cotta clay base – manufactured by Gladding McBean. 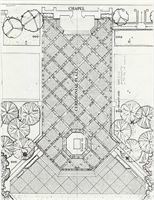 She also helped design the Ceremonial Plaza. 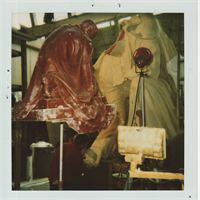 Wax miniature in foreground at Artworks studio in Berkeley – March 1997. Artist Bruce Wolfe working on full-sized hand (oil-based clay over foam core) in background. posing in front of bronze sculpture base. Ceremonial Plaza in front of Chapel, St. Mary’s College, Moraga, CA with de la Salle statue surrounded by water pond. and multi-dwellings over the years. and service to all sectors. Bill Dahlberg, design friend and design partner for 30 years. Ten times the amount of sunlight we need each day falls on our heads and homes. The sun does not break down and need repairs. The sun does not pollute. When there is not enough direct solar energy there is stored solar energy in the water, wood and wind. Now thanks to technology and certain intellient souls, there is co-generation. We are learning how to harness and use that stored renewable energy twice over.